Join Rabbi Morris to study the book of Joshua in the new Bet Midrash at 6:00pm followed by a lecture on Haham Moses Gaster at 7:00pm. Over the centuries the S&P Sephardi community has benefited from the leadership of towering rabbinic figures. This series looks at these erudite individuals, the challenges they faced, and the impact they left on Anglo-Jewry’s Sephardim. Join Rabbi Morris to study the book of Joshua in the new Bet Midrash at 6:00pm followed by a lecture on Haham Solomon Gaon at 7:00pm. Over the centuries the S&P Sephardi community has benefited from the leadership of towering rabbinic figures. 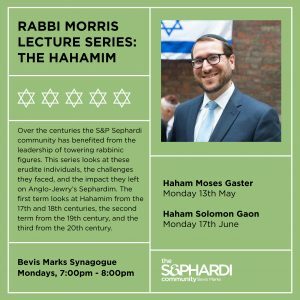 This series looks at these erudite individuals, the challenges they faced, and the impact they left on Anglo-Jewry’s Sephardim.